Grover Cleveland was the 22nd and 24th President of the United States of America, the symbolic leader of the country. His terms in office were from 1885-1889 and from 1893-1897. He was 55 years old when he began his first term of office on March 4, 1885. He was known by his middle name, his birth name was Stephen Grover Cleveland. He had a variety of nicknames including Uncle Jumbo, Grover the Good, The Sage of Princeton, His Obstinacy and the "Buffalo Hangman". Jumbo was a reference to a famous circus elephant and reflected the large size of the President. His Obstinacy nickname was due to applying the veto to more bills than all the combined first 21 presidents. The 'Hangman of Buffalo' - he was the Sheriff of Buffalo and he personally hung two murderers. The picture of Grover Cleveland portrays an interesting image of what this famous man looked like. The picture shows the clothing and the hairstyle that was fashionable during his presidency. He is described as an imposing figure being 5 feet 11 inches in height and 260 pounds in weight. He had blue colored eyes and his hair was brown that turned slightly gray with age. He wore a distinctive long moustache. He was diagnosed with cancer of the mouth and underwent surgery. Part of his palate and his left upper jaw was removed and replaced with a prosthesis, an artificial device that kept the look of his face fully intact. Character and Personality Traits: What was Grover Cleveland like? 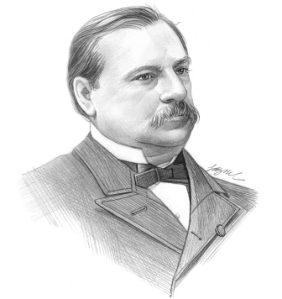 The personality of Grover Cleveland is described as a direct man who expressed his opinions in a blunt fashion. As a young man he had a bright, cheerful and genial personality but this changed significantly when he became weighed down with the responsibilities of his political career. The important role and duties of the President of the United States of America include those of Chief of State, Chief Diplomat, Chief Executive, Commander in Chief, Legislative Leader and Leader of his own political party. What was Grover Cleveland famous for? Why was Grover Cleveland important? The history and life of President Grover Cleveland during his presidency is conveyed in the following fact file in an easy question and answer format. What President was Grover Cleveland? What other political offices did Grover Cleveland hold before his presidency? What was Grover Cleveland' nickname? His most famous nickname was "Uncle Jumbo"
Who was Grover Cleveland' s first lady? Grover Cleveland was famous for the events and accomplishments of his presidency, but what are the facts about the man and his private life. Facts and information about the private life of Grover Cleveland can be found in the following fact file in an easy question and answer format. When and where was Grover Cleveland born? Where was Grover Cleveland educated and what was his religion? What did Grover Cleveland do before he became President of the United States? Who was Grover Cleveland' wife and when did they marry? Did they have kids? When did Grover Cleveland die? We hope that the picture, facts and information on President Grover Cleveland will prove helpful to kids, school children and schools learning about the presidency of this famous American leader. The facts about Grover Cleveland provides an overview of the President's character and personality traits. Watch the video and learn more about the major events of his life and his accomplishments. The following Grover Cleveland video is a useful educational resource for kids, children and schools learning about the life of the US President Grover Cleveland.